The deed is to be used between the parties to guarantee an irreversible right to enjoyment of light and fresh air by one of the parties. This document seeks to ensure easement rights of a party who is rather adversely placed in terms of the location of its property and a construction in the adjoining property would lead to obstruction in its right to enjoyment of light and fresh air. The document creates a firm arrangement between the parties to guarantee an irreversible right to enjoyment of light and fresh air by one of the parties and provides for a comprehensive solution to confirm compliance of the conditions agreed in the terms of this agreement. 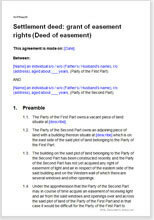 Who will use this Deed of easement? Anyone who is adversely placed in terms of the location of a property and wants to ensure clear right to enjoyment of easements at the hands of the other.